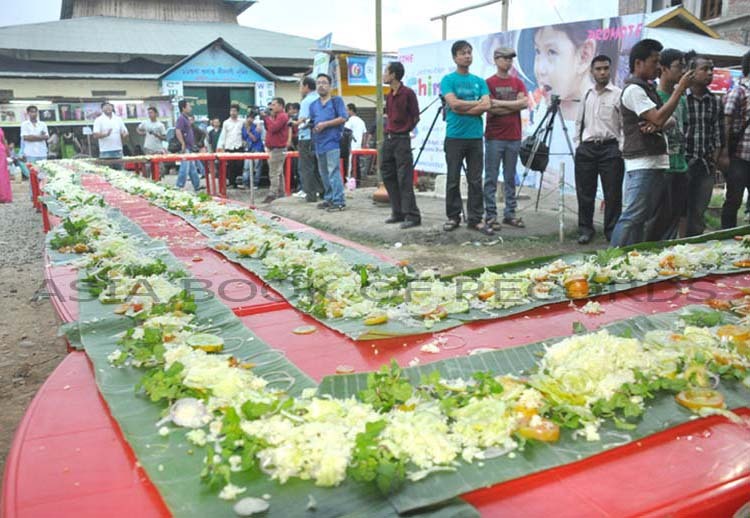 Innovative Youth Society, Imphal, in association with Boss Juices, Imphal (both India), organized an event, wherein a vegetable salad weighing 781.3 kg and measuring 100m in length and 6 inches in width was made in 1 hr 10 mins and 51 secs, on April 27, 2012, on the occasion of International CHINJAK FESTIVAL(III)- INTERNATIONAL, 2012. The ingredients used included onion, cucumber, tomato, cabbage, watermelon, mint, cheese and spices. Comments for LONGEST GREEN SALAD are now closed.